"How do you convert torrent file to .MP3? Alright, so I have been downloading a music album for the past week or so. Now I have got 25 tracks in total. Now...is there a way to rip torrent music files to MP3 audio format so I can burn them to a CD. A simple way is preferred. Surely, i's better there's no much quality loss during the torrent to MP3 conversion process. Do you have any ideas of great tools? Thanks." How to convert torrent files to MP3 for later burning to CD or offline playback on iPod, iTunes, iPhone iPod? Yes, the music ripper tool is the right way. Below we share a program you can resort to for easy AVI MOV MKV MP4 torrent to MP3 conversion with high quality output. Is this MP3 Music Ripper Well-qualified? Try MacX Video Converter Free first and then reach your conclusion. It is specially designed for free torrent to MP3 conversion. Original output audio quality, together with fast conversion speed, that is what it offers. The secret yet special technologies applied are – High Quality Engine and Hyper Threading technology. You can free convert torrent to MP3 with untouched audio quality 192kbps - 320kbps. What's plus, it also supports you to transcode torrent to MP4, MOV, H264, HEVC, M4V, MKV, AVI, FLV, VOB, WMV, AAC, iPhone ringtone, etc. numerous video and audio formats with a mile long of output file list. Free download this torrent music converter or download Windows version and run it. Click "Add File" icon to load torrent file. Head to "To Music" from the output profile drop up menus and select "MP3" as output format. Click "Browse" button to select a destination folder to save output audio file. Click "RUN" button to start to convert torrent files to MP3. 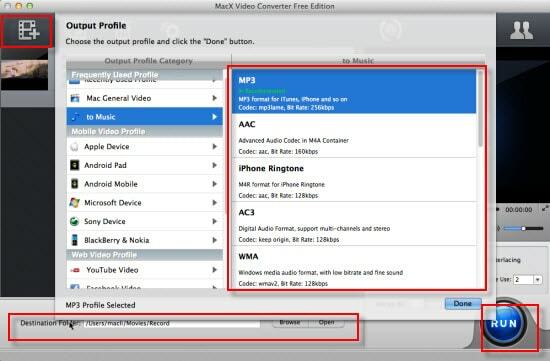 Tips: The advanced pro version MacX Video Converter Pro is not only able to decode torrent video movie in MP4, MKV, FLV, AVI, MTS etc.to MP3, but also extract AAC, AC3, M4A, iPhone ringtone audio from torrent file. Better still, you are allowed to convert torrent file to MP4, M4A, AVI, MOV, over 180 video formats or directly to iPhone X/8/7/6s/Plus, iPad Pro/Mini 4, Samsung Galaxy S9/S9+, Apple Android mobile devices, game consoles and many more. Additionally, it offers a super fast and safe way to download movies trailers songs, soundtracks in MP3, AAC audio etc, 720p, 1080p, 4K UHD MP4 MKV AVI MOV and more from SoundCloud, Audiomack, YouTube, Dailymotion, Metacafe, Facebook, 1000+ sites. You have plenty of free MP3 torrent music download sites to choose from instead of converting torrent to MP3. Such sites give you access to download MP3 music torrents for offline enjoyment, so you don't have to bother yourself to use MP3 music ripper. Here we list some good sites for torrent MP3 downloads, however, we recommend you to download music in a legal way, as torrent MP3 download sites are illegal and unsafe(ads, spam, maware), they are easily removed because of copy infringement issues. No need to convert torrent to MP3, no worries about ads from torrent MP3 downloads, the all-around video processing app MacX Video Converter Pro is introduced for clean and safe MP3 music downloads. It has the ability to download MP3 music from SoundCloud, Audiomack, YouTube, 300+ sites within 30 seconds. It is 100% clean, no virus, no ads, no spam, no tricks. Justin Bieber songs download, Purpose, Sorry, I'll Shows You, What Do You Mean, 25 full album, Hello, One Direction songs, Spectre them song, The Hunger Games Part 2 soundtracks, you name it! To download MP3 songs, hit "YouTube" icon, copy and paste song URL to the box frame. Choose song format, codec, file size. Select a destination folder to save output profile. Click "Download Now" button to start downloading, that's all!